The Acer XR Predator X34 is a stunning curved ultra wide monitor built with gamers in mind. The 34″ ultra wide form factor is perfect for gamers looking for an immersive experience, this beats stringing two smaller monitors together for sure. 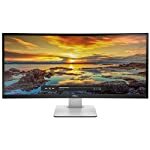 The monitor has a gentle curve that helps you feel part of the game, Starwars Battlefront will never be the same again once you have one of these sat upon your desk. The X34 is the G-Sync version of the XR34, which itself features AMD’s FreeSync technology. The latter tends to be slightly cheaper as there are no additional licensing costs associated with a FreeSync monitor, but Nvidia fans will need to get the G-Sync version if they are keen to take advantage of adaptive sync technology. This is a beautiful monitor which will give you an incredible experience, but it is not cheap. The monitor itself attracts a premium price but you’ll also need to make sue you have a suitable graphics card to run it. An entry level card will struggle to push 3440 x 1440 pixels around the screen a frame rate fast enough to give smooth play. But then if you are looking at buying a premium monitor like this, you’ll probably already be sporting a Nvidia GTX980 or two already! That said, we tend to buy monitors less frequently so it can make sense to invest in one today with the intention of having a card that can power it in the future. The Acer XR sports a “borderless” design which is just 12mm thick around the edges, I’m a big fan of this look and it’s good to see this on what is definitely a premium monitor. The back is a glossy black plastic which does attract finger prints, but I don’t think this is really a problem! The stand is solid but is fairly deep so you do need a good amount of desk space to house this Predator. But then hopefully that’s an obvious point as you are buying a large ultra wide screen here. If space is an issue then this might not be the gaming monitor for you! Either way, the stand is stylish, it does the job and looks sleek. It’s attached firmly by four screws but given the weight of this screen that’s probably for the best. You get tilt and height adjustments. You get HDMI and DisplayPort connectivity but only the latter can be used with high refresh rates and G-Sync. But it’s nice to have a secondary socket for the occasions you might need it. The monitor features an LED strip of lights along the bottom which provides a neat effect, especially if you have LED lights on your monitor. The colour is adjustable, allowing you to create the perfect mood lighting for your gaming room. The X34 isn’t lacking in features thanks to its top notch IPS panel, quad high-definition resolution, 21:9 aspect ratio, gentle curvature and G-Sync technology. Owners report back deep blacks and no IPS glow, this is one good looking screen. The curve of the screen doesn’t exactly wrap around your head but it does help to draw the outer edges towards you. We give the Acer XR Predator X34 a 4.5 out of 5 rating. Want to know what existing owners of the monitor think? You can read real user reviews here. 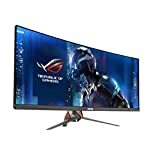 Should I buy the Acer XR Predator X34? The Predator X34 offers a stunning design that will set your desktop apart. The picture quality is fantastic and the curvature helps immerse you into games. You're going to need a big desk and deep pockets to get this! If you are having some doubts about this purchase then why not read some real owner reviews and see what other buyers think. 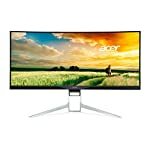 Welcome to the Acer XR Predator X34 FAQ. This section attempts to answer common questions you may have, please get in touch if you have any more queries or if you think our answers need updating. You should find a DisplayPort, HDMI, cable included along with a USB cable. Oh and don’t forget the power cable, you get one of those thrown in too! 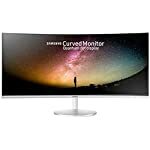 I've heard that there is an issue with firmware on the first monitors imported? 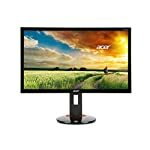 Acer have confirmed that all monitors imported into the UK have an updated v2 firmware.